Bolivia’s Movement Toward Socialism (MAS) is one of the most important and electorally successful new parties in Latin America because it has succeeded in achieving and maintaining high levels of internal grassroots participation and bottom-up influence, even after assuming national power. Unlike the ad hoc electoral vehicles created to sustain the support of a single charismatic leader like Hugo Chávez in Venezuela or Rafael Correa in Ecuador, the MAS has maintained autonomous forms of social mobilization by popular constituencies that have contributed to keeping party vibrancy and served as a check on concentrated executive power. A “party of movements,” the MAS began as a largely indigenous coca growers’ union, but after 20 years of existence and more than a decade in power, it still deviates from the conventional wisdom that such parties inevitably become oligarchic in their operation. Compared to most other movement-based parties, the MAS remains responsive to the interests, demands, and preferences of its social bases – propelling its leader, Evo Morales, to the presidency but also, at times, limiting his authoritarian tendencies. My research, recently published in a book entitled When Movements Become Parties, reveals that Bolivia is a rare example in which a party’s social movement origin not only facilitated party-building but also enabled the party to preserve high levels of grassroots participation in the selection of candidates and the crafting of public policies, with “bottom-up” correctives to hierarchy and concentrated executive authority. While institutional checks and balances can be (and have been) weakened by an ambitious leader like Morales, governing parties more open to bottom-up input preserve opportunities to establish checks on decisions and constrain strategic behavior and hierarchical control. Channels to exert “voice” provide incentives for the social bases to shape important decisions, as these bases become de facto veto actors within the organization. At the broader regime level, when a governing party establishes and upholds well-developed opportunities for bottom-up grass-roots participation, instances of bait-and-switch policy-making are less likely – a condition conducive to policy stability and ensuring the “continued responsiveness” that is central to democratic representation in between election cycles. Finally, when governing parties are more open, they may generate opportunities and incentives for the political empowerment of traditionally marginalized groups by boosting the input that those groups have in the political power game. The MAS has avoided extreme forms of professionalism and “top-down” control. While the party as a bureaucratic organization remains weak after 20 years, that reality has allowed the social bases to act autonomously and continue to influence, constrain, and hold the party’s leadership accountable. This has enabled the party to maintain unusually strong ties with the country’s major popular movements, which still provide a formidable mass base and coalition of support. Today, 12 years after it gained power for the first time, the MAS remains the only truly national party in Bolivia and is that country’s dominant party. The ongoing strength and relative autonomy of social mobilization in Bolivia not only explains much of the MAS’s continued success but also sets the Bolivian case apart from the Brazilian PT, where social mobilization withered, and from Venezuela under Chávez and Nicolás Maduro, where mobilization is strong but largely controlled from above. The system is far from perfect. Poised to seek a fourth term in 2019 after a legally dubious maneuver, polls show that Morales may not be unbeatable. The party lacks a viable successor, and another reelection can open the door to further abuses and greater personalization of power – all of which can undermine the development of the democratic regime. This could also atrophy the links between the party and segments of its movement base, a process already under way. Power is already concentrated in an executive administration that too often treats opponents and the press with raw hostility. Institutions are inefficient, liberal rights are poorly safeguarded, and courts are feeble and politicized. Even if checks and balances on presidential authority have weakened, however, autonomous grassroots participation, inclusion, and accountability are highly robust. Inclusion has created a “new normal” in the Bolivian political arena, with larger numbers of Bolivians enjoying rights of citizenship and greater input into political decision-making and into determining who gets what, when, and how – with the MAS at the center. Seen from the long arc of Bolivian history, this is an exceptional change in a society characterized by social and political exclusion. *Santiago Anria is Assistant Professor of Political Science and Latin American Studies at Dickinson College. His new book, When Movements Become Parties: The Bolivian MAS in Comparative Perspective (Cambridge Studies in Comparative Politics, 2018), studies the internal politics of Latin America’s three most innovative leftist parties: Bolivia’s MAS, Brazil’s PT, and Uruguay’s FA. What Can Be Learned from the Humala Government? As a candidate in Peru’s 2006 presidential election, one-time military coup plotter and current president Ollanta Humala presented himself as an anti-business socialist and nationalist happy to be a member of the “family” of left-leaning Latin American governments led by Venezuela’s Hugo Chávez. In his second successful bid for office in 2011, Humala sharply changed direction and embraced a combination of pro-business and anti-poverty measures reminiscent of Brazil’s center-left Lula. Humala’s shifts are a sign of the times in the Andean region: a non-ideological search for how best to build democracies and grow national economies, while effectively redistributing wealth. Driven by its mining sector and a commodity export boom, Peru’s economy has tripled in size over the past decade and is currently one of the best performing in the world. 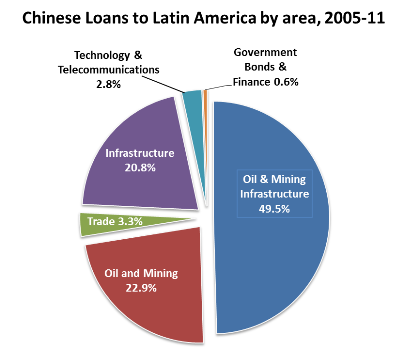 Foreign investment is flooding in, particularly to mining, hydrocarbons, and big infrastructure projects – and Humala is now considered an “investor darling.” While backing off electoral promises to nationalize water, electricity, mining and other sectors, Humala has created a new Ministry of Development and Social Inclusion and increased the budget for social redistribution and welfare measures to Peru’s poorest by 50 percent. So far Humala has channeled the budget surplus of Peru’s export boom, including successful negotiation of a $1.1 billion increase in mining royalties in 2011, toward reducing the nation’s poverty rate by 29 percent. And yet, at present there are more than 250 ongoing social conflicts in Peru, and Humala’s government has been accused of failures of “consultation,” often by grassroots and indigenous protestors opposed to Peru’s mining policies. In response Humala has reshuffled his cabinet multiple times. Skeptics suggest that his approval rating – currently 60% – will last only as long as the boom enables his top-down social spending. Humala’s presidency suggests the limits of viewing current regional leaders through a comparative Chávez-or-Lula lens. Arguments over the best conditions for “foreign direct investment” in the region often miss the different conditions under which it occurs or purposes to which it might be put. Humala’s pragmatism demonstrates how distinct parts of government need not reflect a single unifying ideological or normative idée fixe. Liberal democratic institutions and market freedoms increasingly coexist alongside alternative policies of social redistribution as a part of democratic enfranchisement in the Andes. When conflict has broken out, however, Humala’s government has been willing to forego consultation with local communities to insure the economic resources it needs to continue its redistributive policies. The challenge for him to achieve the best balance between competing democratic priorities will continue. Humala’s government is an opportunity to explore new democratic institutions in Latin America, as with a recent CLALS research project on participatory democracy. 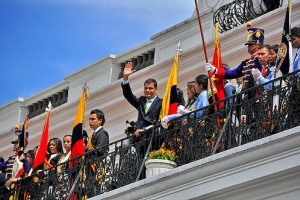 Ecuador Elections: Four More Years for Correa? Like him or not, President Rafael Correa has done what few recent Ecuadorean presidents have done – complete a term in office. When he announced on November 10 his intent to run for re-election, observers in and outside Ecuador immediately declared him the favorite. (Correa ran a second time in 2009, without completing his first term, under the rules of a new Constitution.) Such predictions make it easy to forget how uncertain Correa’s presidency looked when he started it in 2007 – as a 43-year-old, U.S.-educated economist – and how few expected him to succeed. In the ten years prior, social movements led by workers and indigenous peoples toppled a succession of seven presidents. Rejection of IMF-led reforms had been both deep and broad in Ecuador, and it was hard for a president to complete a year, let alone a term. High oil prices have helped Correa succeed by facilitating visible public spending, but that is not the whole story. By almost all accounts, Correa has been far from perfect – his treatment of the press has particularly troubled rights experts – but he has provided some stability and halted the cycle of mass protests, strikes, and presidential turnover. With a blend of economic populism and nationalist rhetoric, Correa has turned the same social movements that were once the scourge of Ecuadorean presidents into a base of support. He has incorporated formerly marginalized people into the “nation” that he claims to defend – what academic Steven Ellner called “a new narrative of nationhood that challenges long-held assumptions.” He has unified policies such as ending the U.S. lease of the Manta airbase with resource-based economic nationalism. Though Correa’s reelection next February 17 looks easy, he will face increased tensions in his third term. Government revenues remain dependent on oil and mining, which are susceptible to price fluctuations. The expansion of extractive activities in areas inhabited by Correa’s indigenous base could strain his coalition – it has already stirred environmental concerns – and government spending has neglected the need to diversify the economy and reduce its reliance on the extractive industry. In addition, Correa has benefited from the generosity of Venezuela, but that support could wane as President Hugo Chávez turns inward to deal with domestic challenges. The opposition, which has continued to present half a dozen candidates for the presidency, will likely begin to unify if it feels threatened by a further concentration of power in the Executive. To win reelection and govern effectively, Correa will need to maintain the unity of an uneasy coalition, without riding roughshod over the opposition and press freedom. American University professor Todd Eisenstadt has turned the conventional story about indigenous peoples in Mexico upside-down. 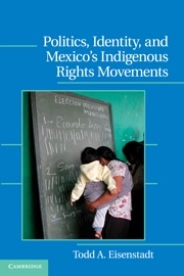 In Politics, Identity and Mexico’s Indigenous Rights Movement,* Eisenstadt presents evidence that Mexico’s indigenous peoples are at present not best characterized exclusively by the pursuit of communitarian ethnic goals and the defense of their collective rights and autonomy. Rather, he shows that indigenous people are often preoccupied with their socio-economic conditions and struggles over land tenure and ownership, more than with ethnicity, and in ways largely comparable to non-indigenous Mexicans. For at least a decade after the Zapatista revolt exploded onto the world stage in 1994, indigenous concerns and critiques of the state helped shape national Mexican politics and public debate. The 1996 San Andrés Accords underscored the Zapatistas’ analysis of the limits of liberal citizenship and of the negative consequences of neoliberal state policies. Now, in late 2012, indigenous political possibilities in Mexico appear very different. The government has still not ratified the Accords; Mexico’s center-left has failed to capture the presidency; and the neoliberal policies of the Calderón administration promise to continue with the PRI’s return to power. Indigenous social mobilization has been fragmented since the early 2000s. Localized conflicts have flared up over government efforts to privatize land for outside investment and development, but these have not led to larger-scale indigenous mobilization. The Zapatistas’ “Other Campaign” has had little impact, and they did not participate in the recent presidential elections. As regular teacher strikes and the attention generated by the spectacle of the “#YoSoy132” anti-electoral fraud student movement have made clear, the national center of gravity of social protest no longer turns on an indigenous axis. Eisenstadt’s book sounds a skeptical note about the possibilities for ethnically-based indigenous mobilization in Mexico. His research underscores that Mexico’s development model does not adequately address the needs of ordinary Mexicans – including of indigenous peoples – at a moment when we should expect more of the same from the Peña Nieto (PRI) administration that takes office on 1 December. He documents the shift away from primordialist accounts of indigenous identity to friction over control of economic resources – a shift from ethnicity to class – that is seen in some other Latin American countries. 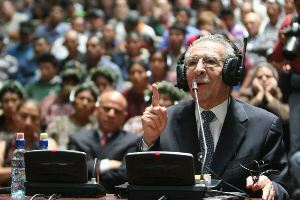 While countries such as Bolivia have actively incorporated indigenous nationalisms into state policy and law, Mexico appears headed in the other direction. This divergence illustrates the elusiveness of the ongoing search for the best balance between collective and individual rights in Latin American countries with large indigenous populations. Peru’s new cabinet installed in July – President Ollanta Humala’s third since his inauguration a year earlier – faces the daunting task of sustaining national development while increasing social enfranchisement. The reshuffle came amid loud criticism of a crackdown, which killed five people, on protests against the proposed $5 billion Conga mining project in Cajamarca. 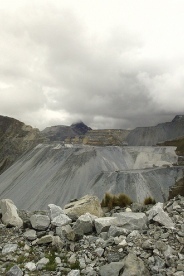 The incident underscored the difficulty for Humala as he endeavors to implement a dual strategy of capitalizing on the growth potential of Peru’s mining industry – primarily gold and copper (60 percent of exports) – while respecting community concerns about the environmental consequences of extraction. Mining wealth is needed to improve the lives of ordinary people –28 percent of Peruvians live in poverty – but unlike preceding governments this administration has committed itself to consultation with residents of localities that will be affected directly. The new prime minister has announced suspension of the Conga project until the U.S. mining company involved provides better environmental guarantees. 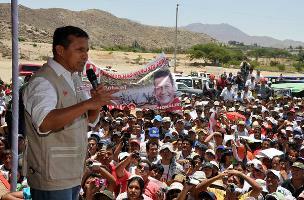 Humala’s popularity has plummeted. Despite new laws increasing Peru’s mining revenue, the creation of a new Ministry of Social Inclusion, and a new Prior Consultation Law, indigenous protesters feel betrayed by Humala. They accuse him of continuing the aggressive extractive policies of his predecessor, Alán García, and insist his administration has not given adequate attention to concerns of local communities on issues such as the integrity of the water supply in zones affected by the mining ventures. Recent signs of a resurgence in violence by the Sendero Luminoso (Shining Path) guerrillas and of setbacks in efforts to curtail the influence of the narcotics trade are also eroding Humala’s support. Humala narrowly won the presidency as a center-left candidate, committed to creating a framework for the more equitable distribution of the wealth generated by Peru’s natural resources. Now, some of his political allies say he has courted foreign investment for the mining sector without adequate consultation, and further protests seem likely. Humala’s challenge is not unlike that of other countries, including Bolivia and Ecuador, trying to balance between these competing interests. His success or failure will have an impact beyond Peru’s borders, as South American countries dependent on commodity exports struggle to walk the tightrope between satisfying foreign investors and domestic electorates.